Size: 8.3" x 4.2" x 0.40"
The California based company Stokes Publishing Company, Inc. distributes under the label "The Educator®" calculators optimized for teaching purposes. William T. Stokes filed already July 30, 1991 the US Patent Application U.S. Pat. No. 5,035,502 with the title "Transparent calculator for overhead projection". Both the keyboard and the display are made from translucent glass and plastics. Using a simple overhead projector the teacher could demonstrate easily the function of a calculator. 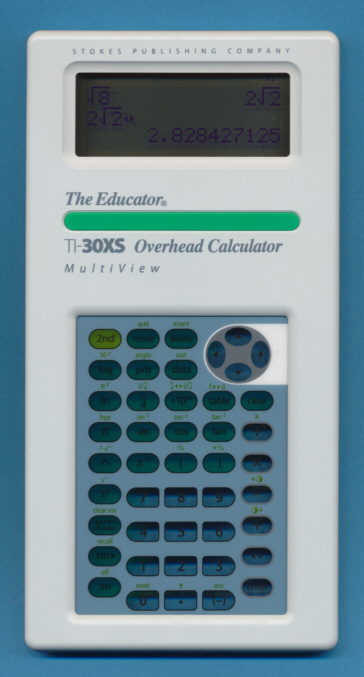 The TI-30XB MultiView and TI-30XS MultiView introduced by Texas Instruments in 2007 developed itself to a very successful school calculators. The one to one replacement from Stokes Publishing Company is this TI-30X II Overhead calculator. The internal construction of the Stokes calculator looks very robust. Both the display and the keyboard make use of support frames. The connectors to the printed circuit board and a lot of screws to make it shock resistant. Overhead™ Calculator is a trademark of Stokes Publishing Company, Inc.
© Joerg Woerner, September 2, 2008. No reprints without written permission.